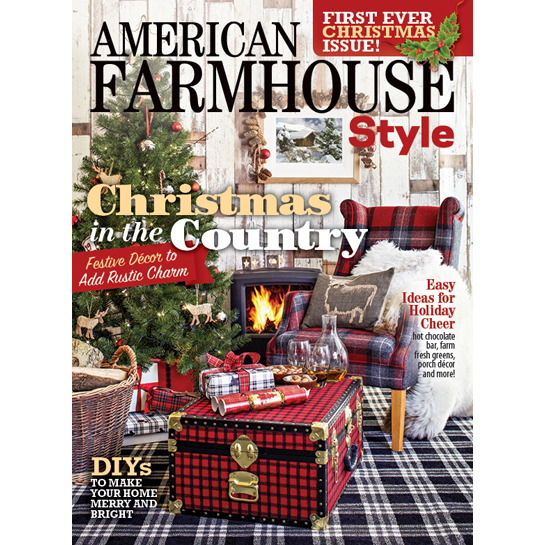 Learn how to turn a newly constructed home into a vintage haven with homeowner Amy Campbell. 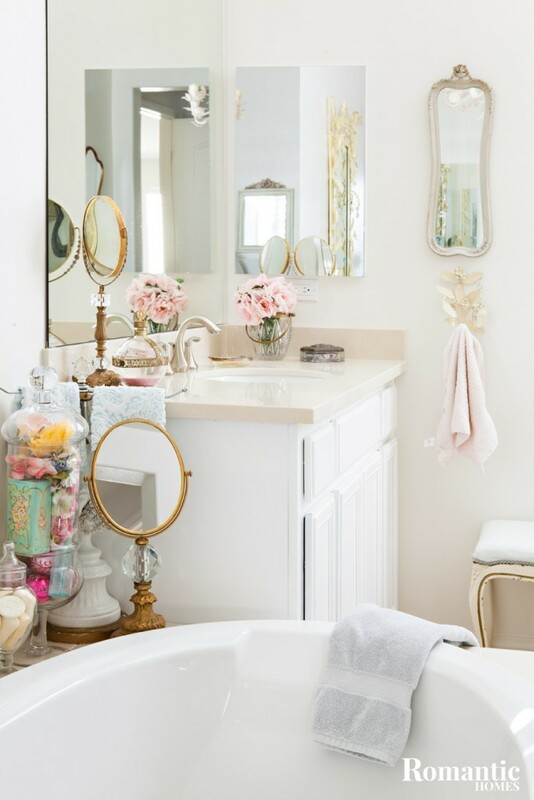 This tract home bathroom gets a vintage makeover with a farmhouse style bathtub and gold vintage bathroom accessories. What do you do when you have a new home, but want a vintage look? 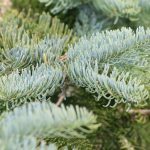 When Amy Campbell and her husband Joe bought a new tract home in Temecula, California, Amy knew she would have to speed up its aging process. Here’s how she did it. 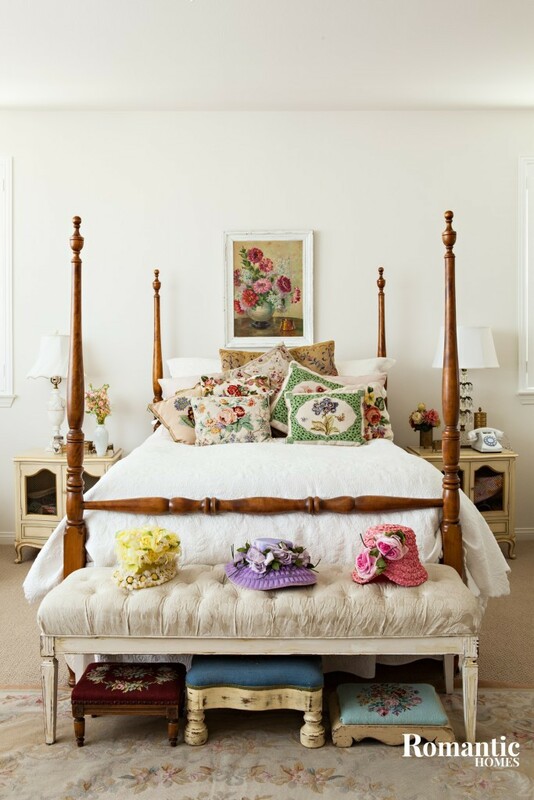 The master bed is an heirloom piece from Joe’s grandparents, and on an end bench Amy displays part of her vintage hat collection. 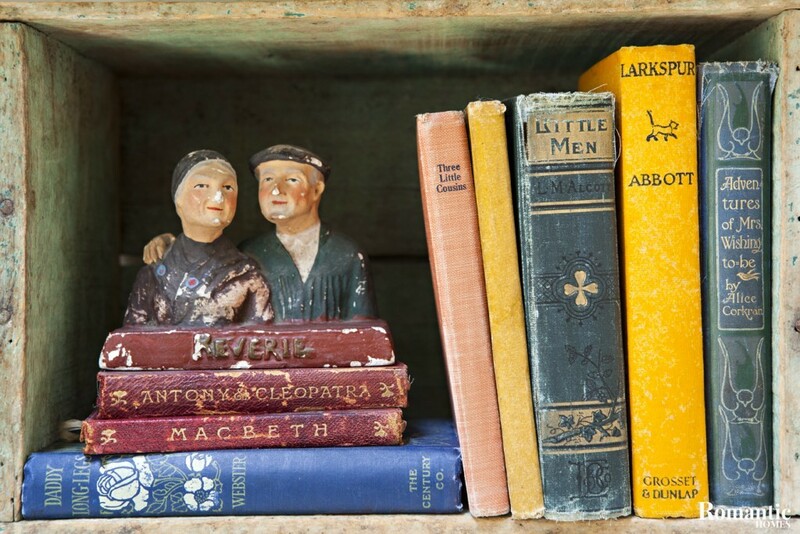 If you want to display vintage items in your home, don’t stop with pillows or statuettes. 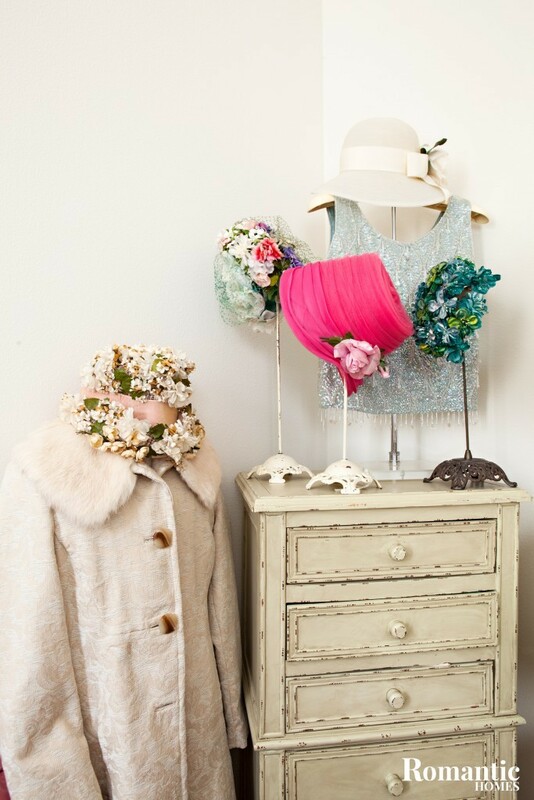 Make clothes into accent pieces with a hat rack or dress form. When it comes to furniture, Amy is all about antiques. 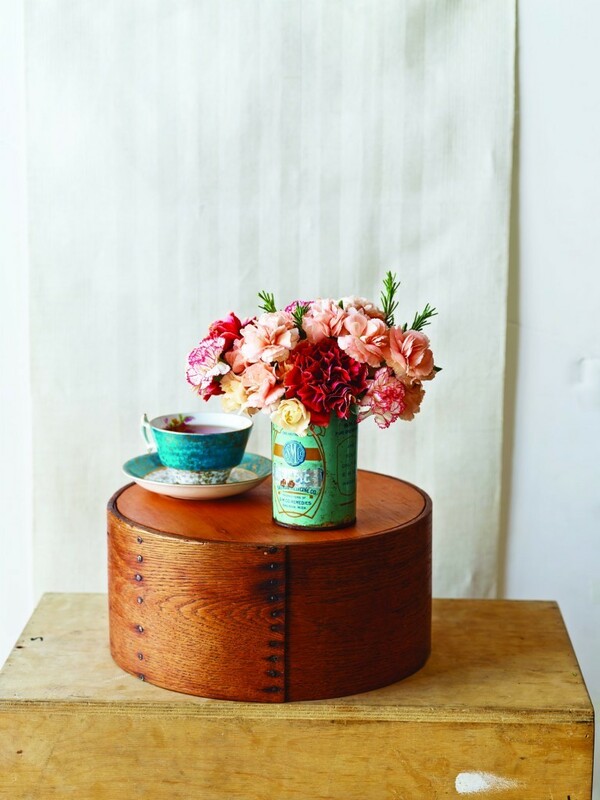 “Everything in my home has to be old and have a history, either vintage or antique,” she says. 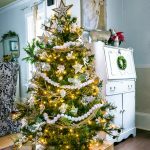 She displays vintage finds throughout her home, and doesn’t stop with the furniture. “I collect vintage buttons and add them to modern clothing,” Amy says. “I also collect floral oil paintings. My great-great cousin was an oil painter, and I started collecting and displaying them, including three of her paintings.” By displaying items such as antique coats and hats, Amy shows off her love of vintage style through small details as well as the larger elements of her rooms. Amy shares her grandmother’s passion for needlepoint, and in the living room, Amy’s work sits next to her grandmother’s on display. Not only does Amy display vintage pieces throughout her home, but she also shows off some of her own handiwork. “I love anything with needlepoint, and I display the needlepoints my grandmother and I made in the rooms,” she says. Even her passion for crafts and hand stitching is part of the heritage her grandmother passed down, and now the work of both grandmother and granddaughter sits proudly side by side. 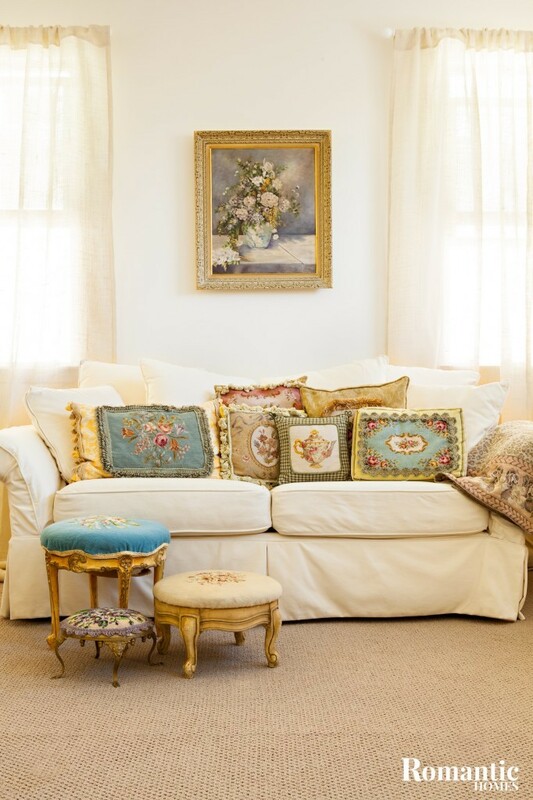 Amy’s needlepoint projects make an appearance in pillows and ottomans in various rooms. 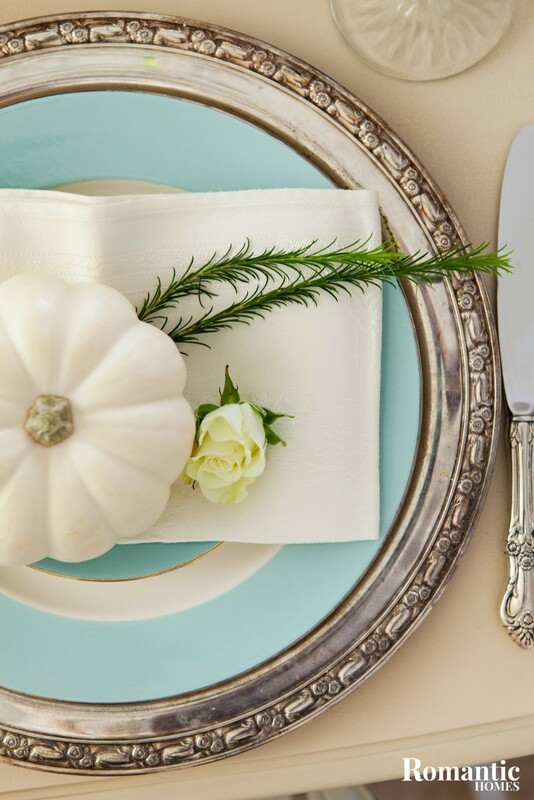 In her dining room, Amy decorates for fall with appropriate white pumpkins and sprigs of green. During the fall months, real pumpkins and needlepointed masterpieces grace her living room, dining table and even bedroom. 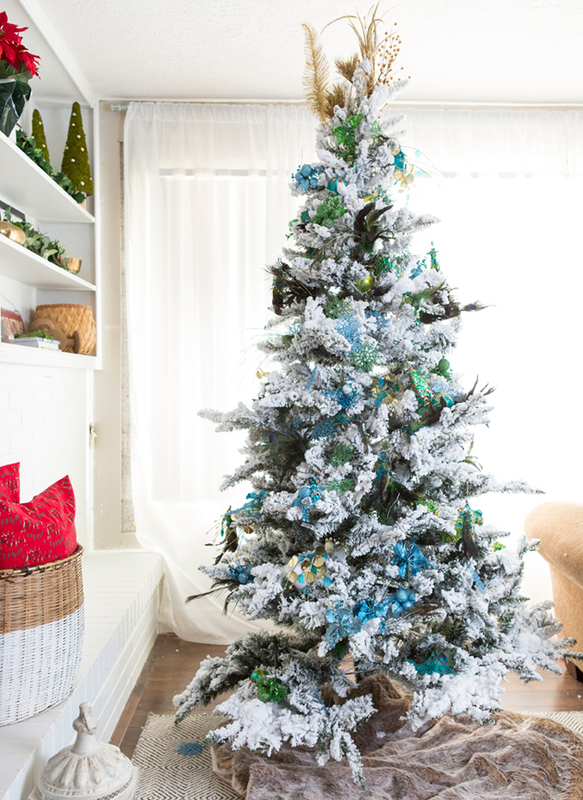 “The beauty of this kind of décor is that everything blends together well,” Amy says. In her book Lomelino’s Ice Cream, Linda Lomelino shares the secrets to delicious, homemade desserts. As we enter the heart of summer, you’re probably looking for a new treat—something to cool your hot skin and tickle your taste buds. 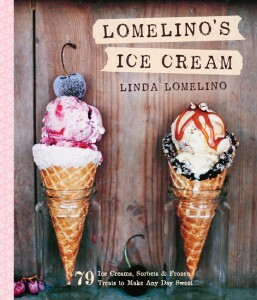 In her book Lomelino’s Ice Cream, Linda Lomelino shares the secrets to delicious, handmade icy treats. “Fact: Ice cream is one of the best treats in life,” she writes. 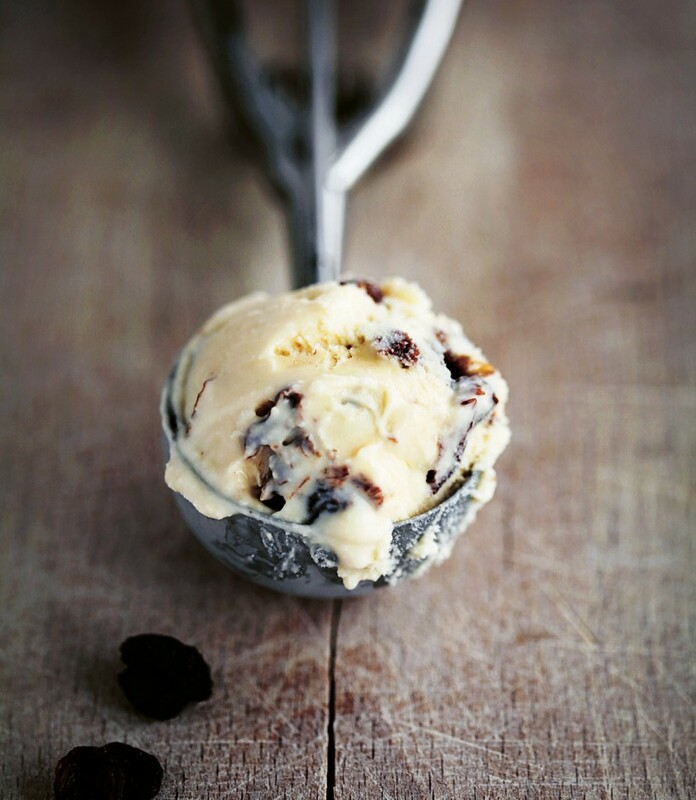 “Another fact: The best ice cream is homemade.” Here are two of her recipes to cool you off this season. Combine the raisins and rum in a saucepan, bring to a boil, and simmer 2–3 minutes. Pour the mixture into a bowl and let it cool for at least 2 hours. Lightly beat the egg yolks in a bowl. Mix the milk, sugar, and salt in a saucepan and heat to the boiling point. Slowly pour the hot milk into the eggs, whisking constantly. Pour the egg/milk mixture back into the saucepan and heat, stirring constantly, until the mixture thickens. 3. Pour the cream in a bowl and place a sieve over it. Strain the egg/milk mixture into the cream. Blend it in. Stir in the rum raisins and the rum. Refrigerate until it is completely cold. Process the mixture in the ice cream machine until ready. Pour the ice cream into a chilled bowl and freeze. Heat the oven to 350°F. Split the plums and remove the pits. Place the plum halves on a baking sheet and sprinkle them with the brown sugar. Bake in the oven on the center rack 30–35 minutes. Let the plums cool. 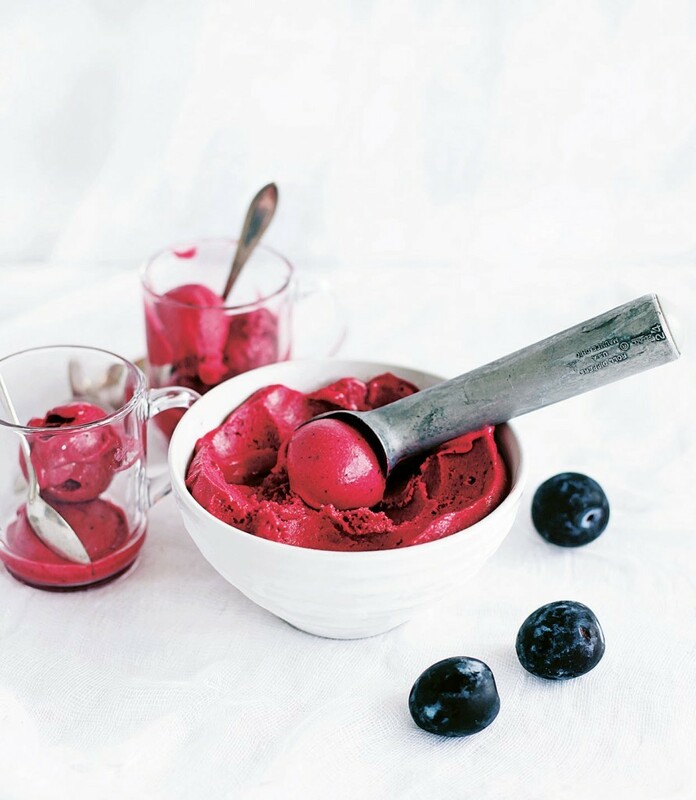 Mix the plums with the lemon juice, water, sugar, and vodka and process to a smooth puree in a blender. Refrigerate the mixture until it is completely cold. Process the mixture in an ice cream machine until the sorbet is ready. Pour it into a chilled bowl and freeze. Lomelino’s Ice Cream: 79 Ice Creams, Sorbets & Frozen Treats to Make Any Day Sweet by Linda Lomelino, published by Shambhala Publications, Inc., © 2015; roostbooks.com. A romantic garden usually contains roses, beds of wildflowers and a shady place to sit. 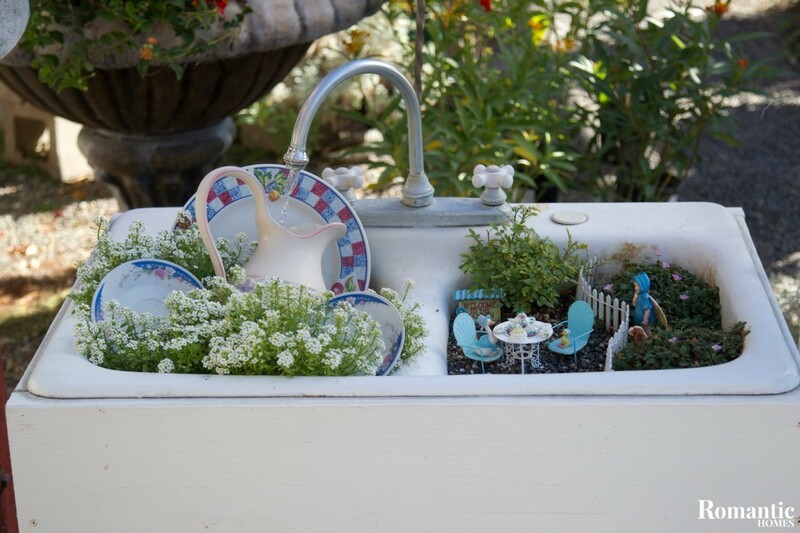 But what if you added an unexpected surprise with tiny vintage gardens for fairies? 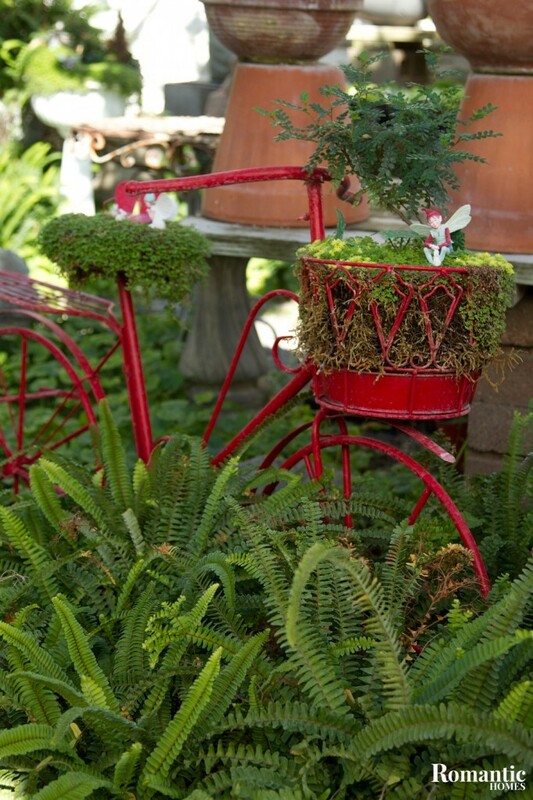 Visitors will be delighted, and you’ll be able to use your garden as another canvas to feature beautiful antiques. Here’s how to do it. Almost any vintage item you find at a flea market or estate sale can become a garden container. From a wood hutch or old animal trough to a chipped teapot or gilded frame, add vintage items that are large or small to your garden. Just make sure the piece has enough room for soil and plant roots. Even an item as small as a teacup can transform into a miniature garden if you don’t crowd it with too many plants. 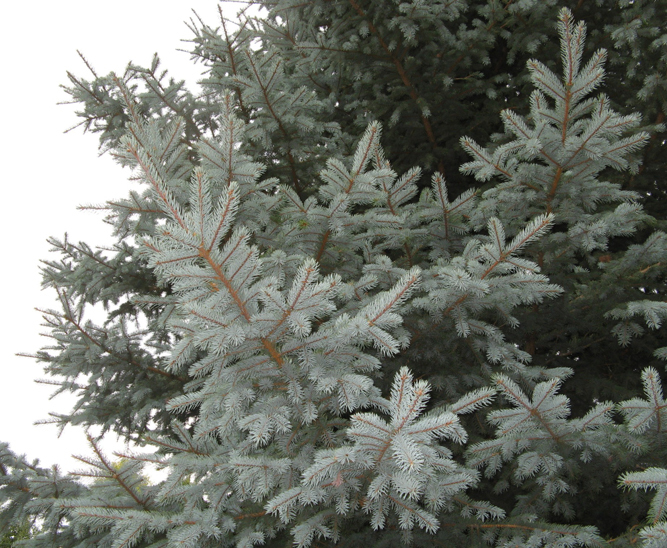 Before you add plants to your container, make sure it’s ready for outdoor weather. For wood or painted pieces, add a protective stain or spray to prevent fading and rot. Metal pieces may gain a little rust, but this will only add charm to the piece. You’ll also need to waterproof the container, so line it with plastic or a rubber waterproofing material. You won’t want your antique wood crate to rot when you water the strawberries you’ve planted inside. First, make sure the piece has good drainage. If it doesn’t, or the drainage would cause rot, place a layer of pebbles or pea gravel before you add soil. 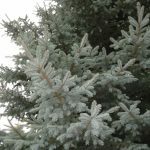 The rocks will act as a water filter and keep the water from sitting in the soil too long, which can damage the plants. Then add your soil and flowers. Create a sanctuary for fairies. Tiny creatures need small spaces with miniature accessories. 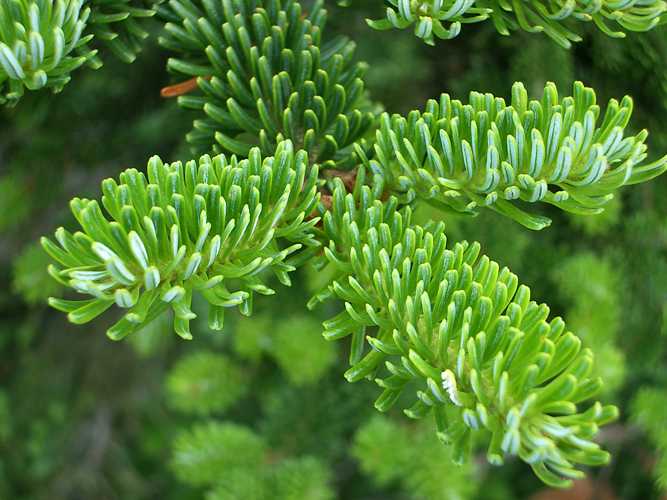 Plant a low ground cover to act as a grassy meadow or lawn; then add small plants and flowers. Finish it off with the accents. Decorate with a fairy-sized table and chair set, or a bench on which the fairies can relax. Don’t forget to add the fairies too! Learn how to keep your home filled with fresh flowers without spending a fortune. 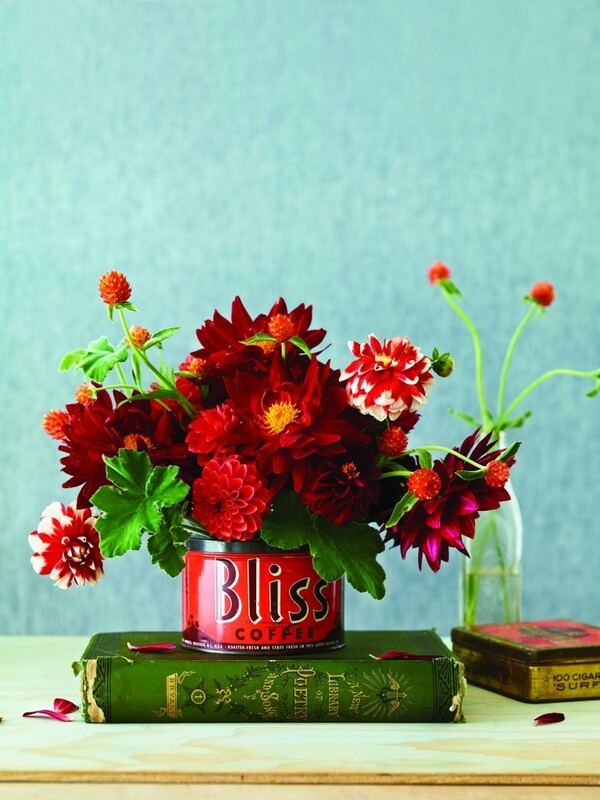 A bouquet of fresh flowers can do so much to brighten up your home. 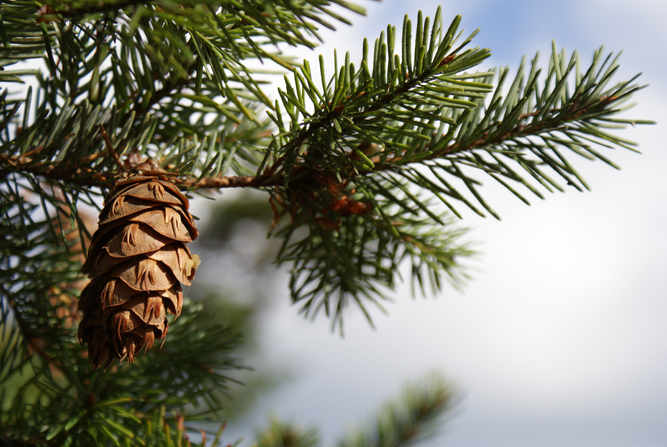 The scent, the bright colors and the reminder of the world outside will add a breath of fresh air to the room. The downside of fresh bouquets is the cost—the flowers will last for about a week (if you’re lucky), and if you want to keep fresh flowers in your home on a regular basis, the costs will add up to a pretty penny. 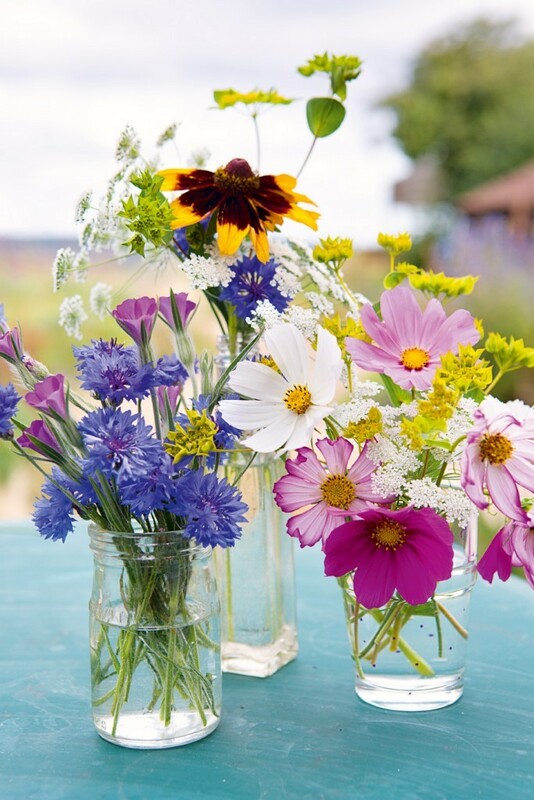 Luckily, there’s a solution—grow your own bouquets! “You can fill your house with flowers without spending a fortune,” writes Alex Mitchell in her new book, Gardening on a Shoestring. 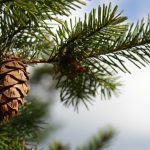 The book is a helpful gardening resource full of tips and tricks for making the most of your outdoor space without breaking the bank. 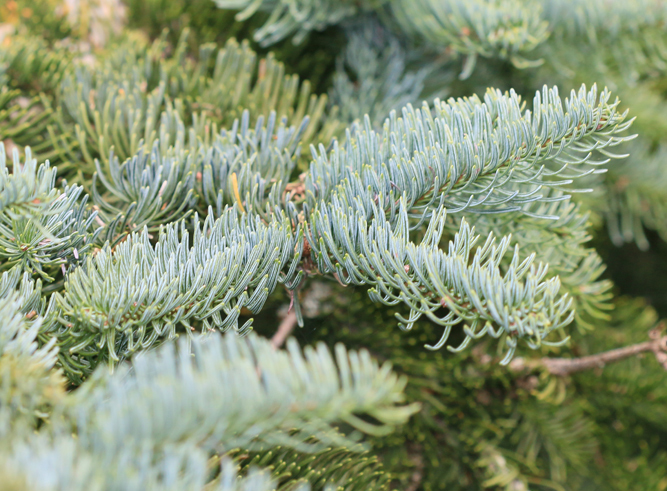 Here are her instructions for how to create a cutting garden in your own backyard. 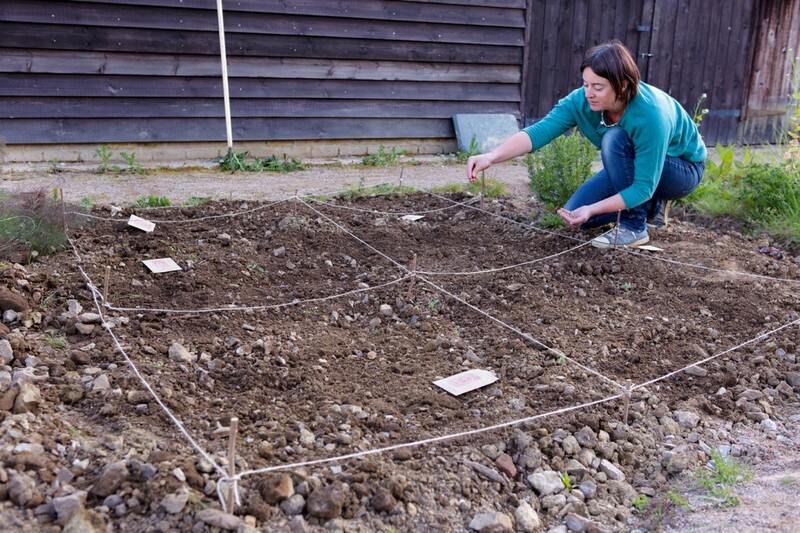 Divide your growing area into six equal squares, staking out the grid with twine tied to sticks pushed into the soil. Then sow each square with a different variety of seed. Rake over the soil gently to cover the seeds and water well. Keep the patch weeded and protect the young shoots from slugs until established. Sowing each variety of seed in a different square makes harvesting and weeding easier. 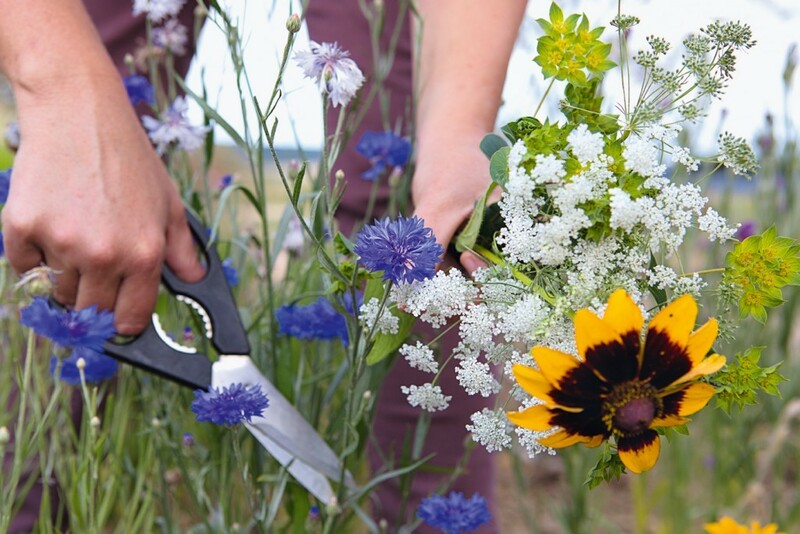 Cut the flowers throughout the spring and summer to keep the plants blooming! 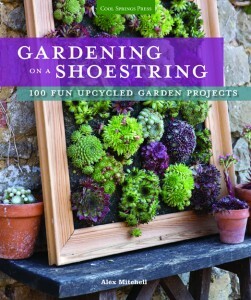 Gardening on a Shoestring by Alex Mitchel, published by Quarto, © 2016; quartoknows.com. Instead of a text, give your loved one a bouquet of flowers to show them you care. Here are the meanings behind popular flowers to help you form your bouquets. Flowers aren’t just beautiful—they can also send a message. “In the Victorian era and even long before that, flowers served as beautiful messengers that whispered what often could not be spoken aloud,” write Leigh Okies and Lisa McGuinness in their new book, Meaningful Bouquets. From anticipation and affection to forgiveness and friendship, a bouquet of flowers can help you speak to a family member or friend in a new way. “[In the Victorian era], they were the equivalent of clandestine text messages or notes of encouragement,” the authors write. 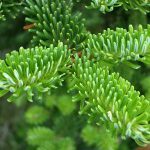 Here are a few flower meanings and how you can combine them to create a beautiful message. For more ideas, including bouquets for celebration, luck and passionate love, get a copy of Meaningful Bouquets here. 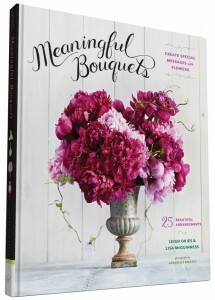 Meaningful Bouquets by Leslie Jonath and Lisa McGuinnes, photography by Annabelle Breakey, published by Chronicle Books, © 2016; chroniclebooks.com. The basic guide to starting your own book collection. When you’re out shopping at your favorite market or antique store, participate in the long, illustrious tradition of book collecting. Of course, you can just pick up titles that catch your eye or have beautiful covers, but if you want to start a library-worthy collection of your own, check out these tips. Choose what kind of books to collect. Collect by genre. You can choose any kind of book, from vintage school textbooks and dictionaries to classic literature or stories you read as a child. But whatever genre you choose, make sure it’s a subject you love. You won’t keep interest for long if you start your collection simply for the sake of collecting. Collect by author. You can shape your collection around a specific author or a group of authors. Collect texts by famous poets like Shakespeare and Robert Burns, or stick to modern literary geniuses such as T.S. Eliot, Ernest Hemingway and Virginia Wolfe. Collect by aesthetic. This method is a bit different because you’ll look at each book as an art piece instead of searching for books by their content. Try collecting music books with interesting graphics or hardback books with bindings from the 19th century. Find the right books for your collection. Condition. Book sellers categorize the condition of their stock with the same set of terms. A book in “As New” or “Fine” condition has very little wear, with no loose pages, stains or writing. “Good” and “Fair” books may have some writing, wear on the binding and a few dog-eared pages. 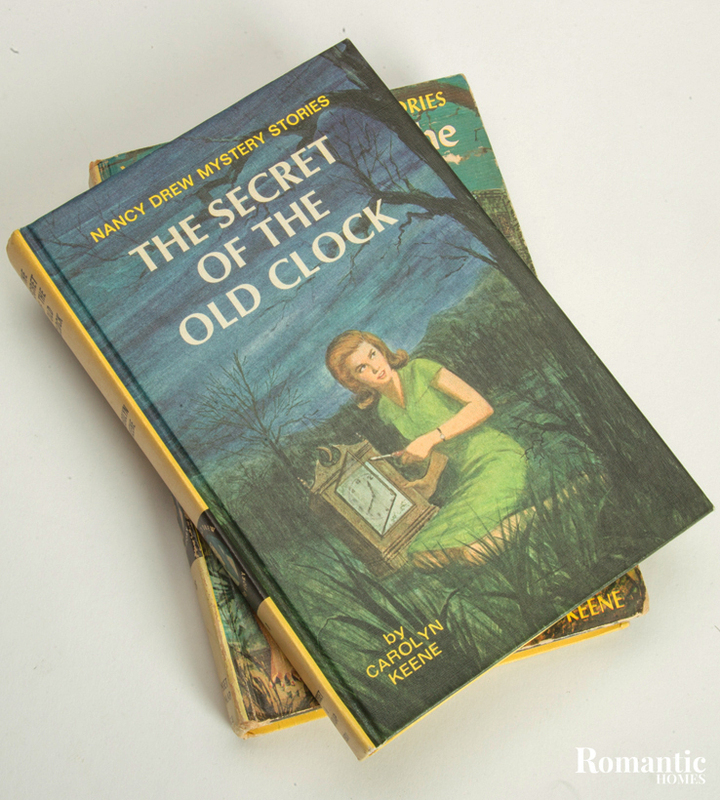 Beware of books in “Poor” condition, which may have a torn, stained or missing cover, and missing pages inside. Edition. The first printing of a book, also called the first edition, can be very valuable, especially if the book has gained popularity over the years and had a small initial print run. To tell if a copy is a first edition, check the copyright information inside the book against the book’s publication year. If the copy mentions any other years, it’s not a first edition. Some books will also contain a “First edition” label. Dust Jacket. You’re in luck if the book you’re after has its original dust jacket. This will make the book more valuable because dust jackets are so easy to lose and tear. 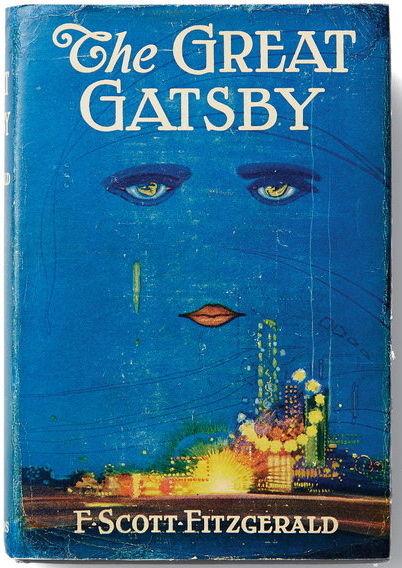 For example, a first edition copy of The Great Gatsby without its original dust jacket is worth about $2,000, but a copy with its dust jacket will sell for over $190,000 because the dust jacket artwork is so famous. Above all, do you homework. Become familiar with the kind of book you want to collect and the typical price ranges for the author’s work or genre of books. Then get out there and start looking! Abe Books is a good resource to find and become familiar with old and rare books. Peter Harrington also has a wide range of information about rare books, including a great article on first editions. 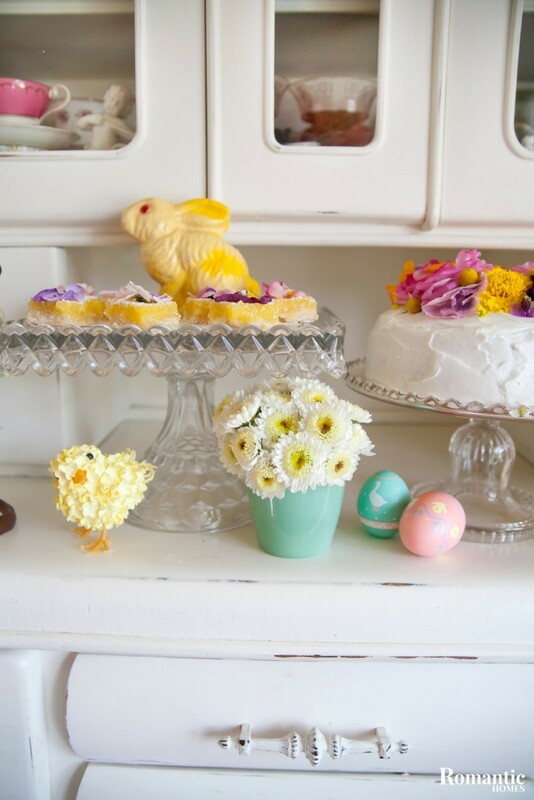 Surprise everyone this Easter with these fun and creative holiday favorites. It’s time to start thinking about your Easter celebration! Here are 5 spring-inspired party ideas to help you get going. 1. Use an egg as your centerpiece. 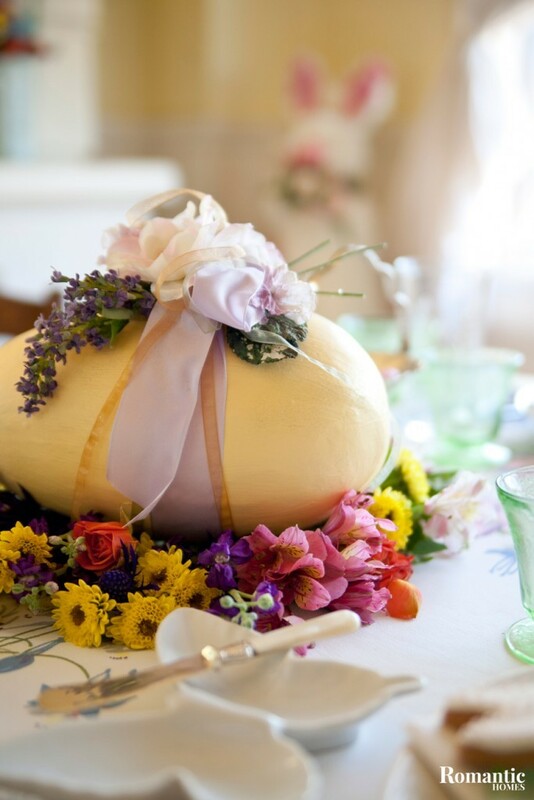 This beautiful giant egg is the perfect size for an Easter centerpiece—it catches the eye but isn’t too large or tall to block views or take up food space on the table. Set on a nest of wildflowers, the combination of the egg and blooms is a show stopper. If you can’t find a giant easter egg, dye some regular-sized eggs and create a nest full of them on the table. 2. 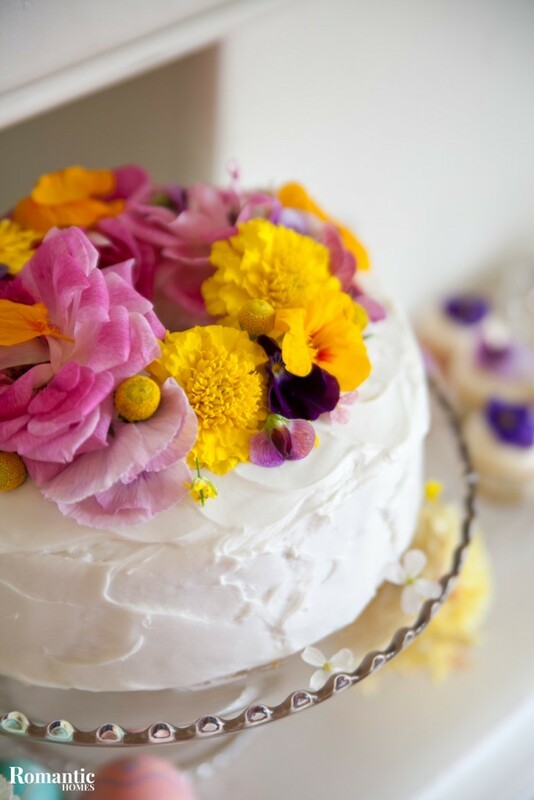 Add flowers to your cake. Whether you’re serving cookies, brownies or cake for dessert, decorate the top with fresh cut and washed flowers. This will bring the bright bloom of spring to your table. 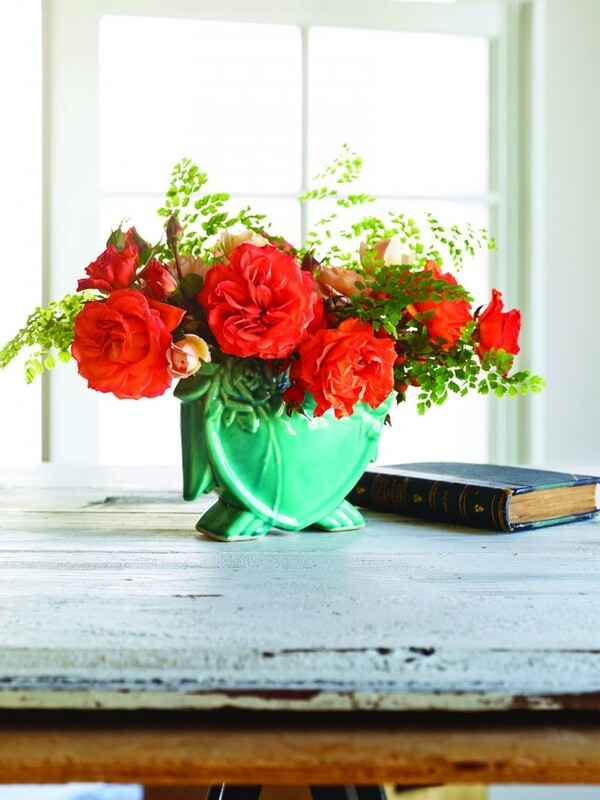 Try a combination of roses, pansies, daffodils, carnations and poppies to create a colorful splash. 3. Use a vintage element. 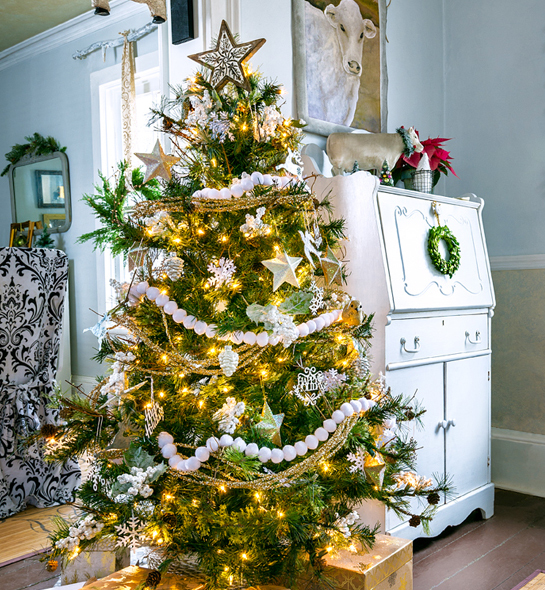 No party or decoration is complete without a vintage element. 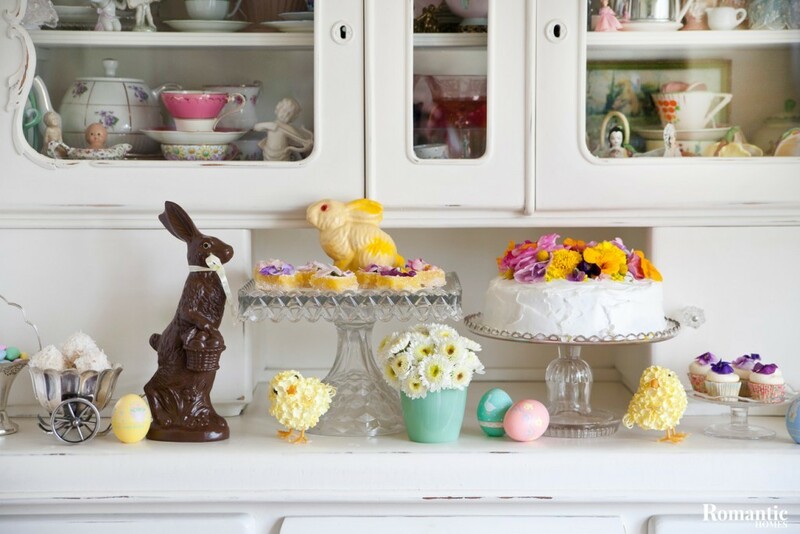 In this pretty sideboard setup, a vintage vase with fresh daisies graces the dessert spread. 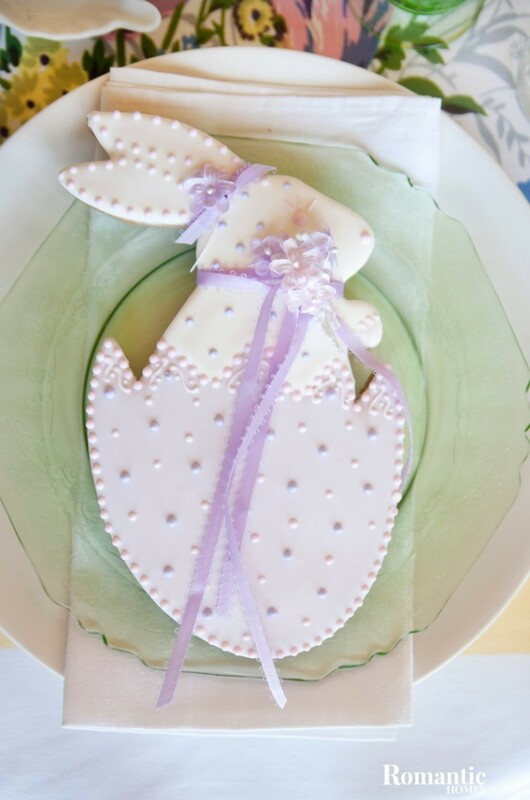 You could even add a vintage statuette or figurine, such as this rabbit, to the dessert tray itself. This will add height and depth to your display. 4. Serve rabbit food. Alongside your roasted chicken and deviled eggs, include some rabbit-friendly eats such as carrots, beets and greens. 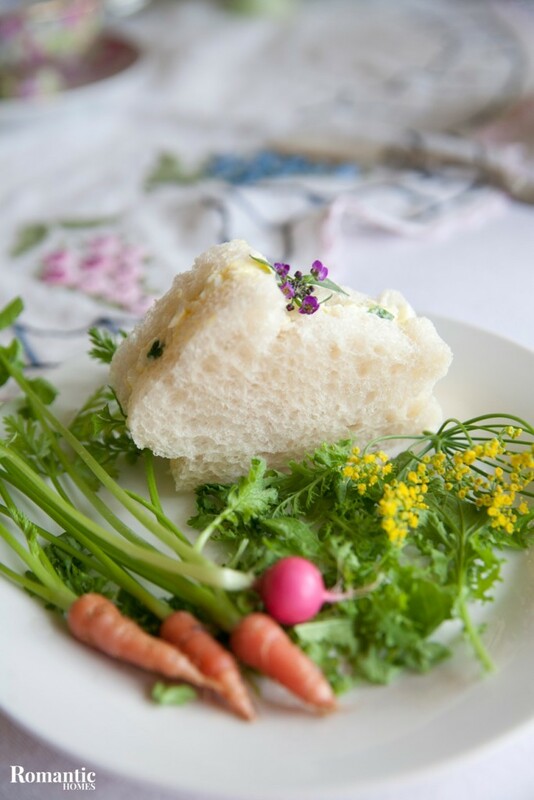 You could even pair the greens with rabbit-shaped tea sandwiches. Simply construct the sandwiches (egg and chicken salad work well) and use a rabbit-shaped cookie cutter to create your desired shape. Include a few pb&j sandwiches, and the kids at your table will be delighted! 5. Surprise your guests with a take-home favor. Make or buy a small favor for your guests to take away from the day. Even if you’re serving other homemade desserts, a beautiful decorated cookie wouldn’t go amiss as a party favor. You can set one cookie at each place, which will delight your guests and add an extra element to the tablescape. For more on Diane Sedo, visit here.